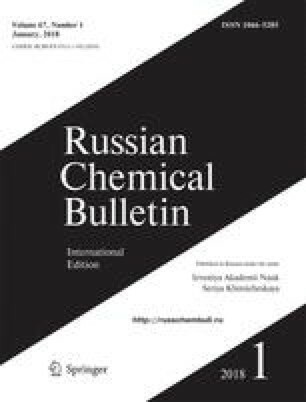 Complexes of palladium (II) and rhodium (III) with 4-hydroxy-3,5-di-tert-butylbenzo-nitrile have been synthesized and it has been found that during their oxidation the metal-ligand bond is broken to yield the free nitrilophenoxyl radical in solution which under the action of the transition metal salt undergoes cyclotrimerization with formation of the non-symmetrical triazine. Translated from Izvestiya Akademii Nauk SSSR, Seriya Khimiya, No. 5, pp. 1143–1146, May, 1984.